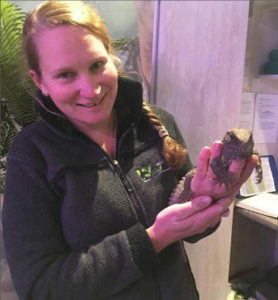 We are delighted to welcome our lovely new husbandry manager, Kim Revelly to the team (pictured to the right with our female tuatara Ātaahua). Kim has moved over from Australia with her fiancé and her dog to be here with us. Kim has previously worked with a variety of reptiles, amphibians, birds and mammals throughout zoos in Queensland such as Currumbin Wildlife Sanctuary, Alma Park Zoo and Australia Zoo. She has worked with all sorts of crazy animals, including venomous snakes and crocodiles! So we have no doubt she will be amazing in her new position here at the Wildlife Centre. If you see her around be sure to give her a wave and a warm welcome to our wee little town!